We met with Betül Çakırca, a museum historian and researcher and talked about the issues we have heard so much, such as the exhibition of Islamic Art, the exposition of the sacred in museums. Although the museum is a secular institution, where should we put the art of Islam in the museum, the exhibitions of the Love of the Prophet, the Sacred Relics? We asked her all these questions and she kindly summarized us, with its main points, this very long and complex subject to which we are strangers. What kind of changes happen when these people, who have already seen these works in mosques or in tekkes, encounter with them in museums, galleries or in the collection of a famous businessman? Or, how does a Muslim museum visitor behave in front of these works? Is it the same thing to visit the Beard of the Prophet in a mosque and to visit it in Topkapı Palace? Is it possible to develop a common manner and attitude? Do the sacred relics make the place in which they are exhibited holy? Is the manner of a non-Muslim and a Muslim visitor towards these works the same or should it be the same? We are not familiar with “Exhibition of the Holy” as a concept. When did this concept and the issue of exhibiting the holy occur both in the world and in our culture? As a concept, “Exhibition of the holy” is something new for us and it has not become an issue of discussion yet. As a matter of fact, exhibition and museology, in its modern sense, begins to develop in the second half of the 18th century. However, collecting, keeping and preserving objects that have a peculiar meaning is not something new. Even in the Middle Ages, there is a manner of collecting objects, though not in modern sense. In terms of the sacred, we have “Sacred Relics” for example. 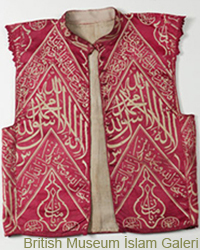 There are “Hırka-i Şerif” (Prophet Muhammad’s Cloak) and “Sakal-ı Şerif” (Prophet Muhammad’s Beard) that are exhibited in certain dates and places. Besides, there are calligraphy plates and some other objects that both add beauty to places and give messages. We know that in the Renaissance churches and monasteries of Europe, there was a demand for the objects that were believed to be sacred. These objects made these places sublime in the eyes of people. For example, the whalebone of the whale that swallowed Prophet Jonah might have been taken from the whales that came ashore along the coast of the North Sea but still, it is believed to be sacred. Or, the bones of saints. We can give lots of similar examples. These objects give a kind of holiness to the church, cathedral or the place in which they exist and they were used to attract Christians. With the Renaissance, there appears a new manner of collecting named “cabinet of curiosity”. Astonishing rare objects that were collected in churches and more than this were continued to be collected in private collections. In these museums, most of the pre-modern objects among these collections are sacred objects. In fact, the objects they took from tribes, the drawings they moved from churches and sculptures were all sacred. However, this became an issue of discussion under the name of “the exhibition of the holy” only after globalist approaches in post-colonial era. Before that time, there had not been such a discussion neither in the world nor in Turkey. Are there any classifications as Islamic or Non-Islamic Art in Western museums during the early period of museum movement? In fact, this museum movement that started in the first half of the 19th century did not mention Islamic art initially since the concept of “Islamic Art” had not been formed yet. Islamic artworks, which started to become more visible in museums in the second half of 19th century, are mentioned in the catalogues as “Muhammadan art”, “Saracenic art” or with the terms indicating nations like “Persian Art”, “Arabic Art”. Gradually, these works started to take part in art marketplace. “The Oriental Goods” that had been demanded in the West as the objects of oriental desires, were now taking place in the auctions and exhibitions; they also attracted the attention of museums and collectors. The History of Islamic Art found a place within the field of Art History and became a subject of discussion that has been continuing until this day. One of the oldest of these discussions is the question that whether Islamic Art is a religious art or not. The issues like the prohibition of portrayal in Islam and the historical concepts of the works that became integrated with religious places fed these discussions. Thus, the issue of the exhibition of Islamic art coincides with the exhibition of the holy. On the other hand, most of the works and objects that constitute Islamic collections had been collected from public places and gathered at one time. These works had been in use within public places in different areas. 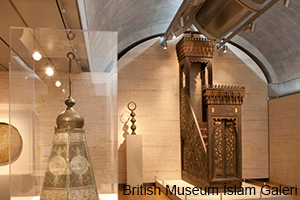 Their preservation first in the Ottoman Museum and then in Turkish Islamic Art Museum was both an issue of security and an issue of the preservation of Islamic Civilization that coincided with the years, when Islamic works started to become visible in European museums and exhibitions. The transportation of the works from the places to which they were devoted to museums, warehouses and exhibition halls did not cause an opposition among society. These museum studies must have been accepted because of the increasing burglary in public works, harsh conditions under the effect of war and the fact that the Directorate of Foundations could not preserve these works. The issue of whether there is holy in Islam or not is still being discussed. And this discussion is held by means of the Western discussions on the holy. On the other hand, the concept of Islamic art has not been defined and its limits have not been determined yet. Thus, since these issues have not been discussed within the context of museology, more complicated issues like the exhibition of the holy do not come to fore. Putting the problem of the “exhibition of the holy” aside, what, do you think, lies beneath the acts like the opening of Islamic galleries in museums and the obvious visibility of Islamic art in recent years? Let me tell you something interesting that museum is at the same time a media. When we evaluate museum as a media that enables relationship and communication, that enables giving and receiving message, we come to the example of 9/11. After 9/11, although Western media made a constant emphasis on Islamic terror and reflected Islam as the target, Western museums, as part of the same media, displayed a counter manner. Could You Please Elaborate on This? What does this mean? After 9/11, ironically and unexpectedly, the interest in Islamic art galleries increased. Just like the increase in the sales of the Holy Quran. People wanted to learn about Islam, which was constantly mentioned with terrorism in media. In other words, Islam and Muslims become a subject of agenda. After the 19th century, when Orientalist obsessive behaviors were common, this was the first time that the discussions on Islamic art stirred. Since the number of visitors in museums increased and questions started to be asked, various museums from Metropolitan to Louvre started to restore or develop Islamic collections. That is to say, the manner of exhibiting what they plundered has continued for centuries? Sure. There is one common sentence that is seen in all the interviews done with the curators after these restoration periods: Besides terrorism, Islam has also a good and pleasant aspect. This, in fact, consists of a presupposition. Ottomans do not call these works as Islamic Art, do they? How are the Sacred Relics mentioned in Ottoman Achieves? In my opinion, one of the distinguishing features of the Ottoman Empire was the fact that the Ottomans had pioneered to use the concept of Islamic Art as Islamic Fine Arts, including Islam within the concept. What we call as the Sacred Relics are mentioned in the Ottoman archives as “emanat-ı mukaddese” or “emanat-ı mubareke” and these objects, as we commonly know, are those sacred objects that Selim I brought to Istanbul after he became the caliph. What kind of objects are there within these first sacred relics that Selim I had brought? In fact, we do not know for certain what this first collection that Selim I brought consisted. However, besides the objects that he took after the conquest of Kairo as the caliph, there must be some other objects that came with the key of Kaaba. This collection had constantly developed with the relics that were taken from various places and with the gifts sent from various countries. Moreover, the relics which were recovered from Wahhabis during the World War I, were taken to Istanbul and thus the Collection takes its current form. So, we do not know for certain what the first relics that came with Selim I were. 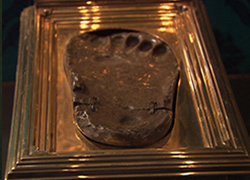 Among these relics, the most special, the most sacred ones were the Blessed Mantle, the Blessed Footprint and the Beard of Muhammad. You know that the room where these objects are kept is called as the Chamber of Blessed Mantle. Since the sacred relics were brought to us with the caliphate, these relics have both religious and political importance. That is to say, the fact that you possess the sacred relics means that you also possess the power of the Islamic world. In this respect, the fact that these sacred relics are still here today is also important. There are such kind of sacred objects in other Islamic countries but we have the main collection. Could you please explain us that main collection? 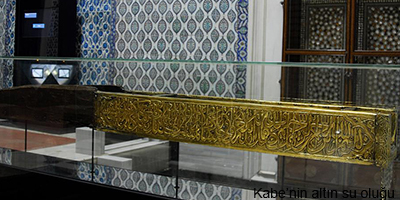 What is the latest situation of the Chamber of Blessed Mantle at Topkapı Palace? With the restoration of Topkapı Palace, Chamber of Blessed Mantle between the years 2005-2008, a new arrangement and interpretation was installed. One of the things that was emphasized in this reinterpretation is “People of the Book”. That is to say, one gallery is designated for the prophets that the People of the Book believed to or it is reinterpreted within this context. During your visit, the gallery offers you a route. It offers you a route not only to guide you among the crowd but also to give you the opportunity to understand and interpret what you see in a certain sequence. After you exit the gallery, you visit the key of Kaaba, the sacred relics and then you arrive at the gallery, which is specifically designated for the Prophet Muhammad and the companions. You see the swords of the companions that preserve that gallery, the room, in which the blessed mantle is kept and the beard of the Prophet. You arrive at the last gallery walking through the corridor, where the Holy Quran is recited for 24 hours. In one of my visits, there were objects that belong to the People of the House (Ahl al-Bayt). What kind of objects are there in the gallery of the People of the Book? The Staff of Moses, the Turban of the Prophet Joseph, the Sword of David, the Cooking Pot of Abraham, the arm and skull bones that are believed to belong to John the Baptist or the Prophet Yahya. Let me elaborate on this. Probably, a Muslim sultan would not keep the bones of a prophet but he would rather bury them. This arm must have been among the Christian sacred relics that were taken during the conquest of Istanbul. 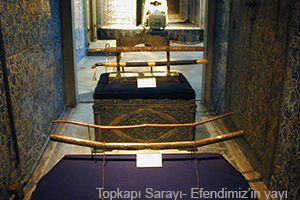 The fact that an object that belong to the Christians was kept within the borders of Topkapı Palace, most probably within Hagia Irene, caused an impression upon Christians that this place was secret and powerful. We see that in recent years, the number of Islamic exhibitions has increased. Have we discussed on the issues of the exhibition of the holy or the exhibition of Islam and come to a conclusion? Discussions on museums have increased relatively in recent years. However, I think that we are still speculating on the issue with the effect of translations. That is to say, most of the people who engage in museum-related studies, gain information about the issue from foreign sources since the literature is not sophisticated enough. Although we have museums for nearly 200 years, we do not have our own, settled terminology. As for the exhibition of the holy, first I would say that we also have a problem with the concept of “holy”. The issue of whether there is holy in Islam or not is still being discussed. And this discussion is held by means of the Western discussions on the holy. On the other hand, the concept of Islamic art has not been defined and its limits have not been determined yet. Thus, since these issues have not been discussed within the context of museology, more complicated issues like the exhibition of the holy do not come to fore. Formerly, people had the chance to encounter with artworks in various places. From a street sign written in a beautiful form to the ornaments upon fountains; from calligraphies within the places like mosques, tombs and tekkes to iron fences people were within a unified aesthetic manner. They could taste the religious and aesthetic experience at the same time in most of the places. Moreover, history was also a part of their lives. They encountered with the artworks within their own contexts. In order to experience all of these, they did not have to plan a special activity and go to a museum. The collection of these works started towards the end of the Ottoman Empire. In this period, the works in danger were specifically collected. The collection of these works during the first years of the Republic, especially after the law on the ban of tekkes and lodges, became so unbelievable. The places where these works existed were closed. For tens of years, people could not find an opportunity to reach these works. There is a long and a serious period of defamiliarization and suspension. As the severity of these years decreased, Islamic art and Islamic artworks started to receive attention once again. For example, the sacred relics were opened to visit after long years. Likewise, the tombs were started to be opened to visit gradually. Once I worked with Bangladeshi women, who converted to Islam recently, in order to understand the reaction of Muslim society towards the Islamic Gallery in British Museum. It was the first time they visited a museum in England and most of them had not visited a museum before, even in their own countries. They were so affected and excited in Islamic Gallery. In the Islamic Gallery of British Museum, I also saw a visitor that was praying. While undergoing a religious experience in these places, they also experience an aesthetic pleasure by looking at the most elegant examples of Islamic art and become honored. So, what happens in the museum or in an art gallery when we see and watch hilya (physical description of the Prophet), which we pay respect when we see them in mosques? What kind of changes happen when these people, who have already seen these works in mosques or in tekkes, encounter with them in museums, galleries or in the collection of a famous businessman? Or, how does a Muslim museum visitor behave in front of these works? Is it the same thing to visit the Beard of the Prophet in a mosque and to visit it in Topkapı Palace? Is it possible to develop a common manner and attitude? Do the sacred relics make the place in which they are exhibited holy? Is the manner of a non-Muslim and a Muslim visitor towards these works the same or should it be the same? What kind of services should museum administrators offer in such encounters to satisfy the physical and spiritual needs of visitors? These are some of the issues that have not been discussed in Turkey and most probably in other Islamic countries. That is why what I am going to say here would not be more than my personal opinions or observations. However, with the modern understanding of museology, these problems are discussed loud and clear. Victoria and Albert Museum conducted a poll with Muslim visitors and evaluated their expectations when they opened Jameel Gallery, which is a good example to this. However in Turkey, if you discuss an issue about museology with respect to Muslim visitors or different ethnic groups or sects, it may be perceived in a different sense. Do you think that museum enables aesthetic and religious experience at the same time? It is for certain that the experience in a religious place and the experience in a modern, secular place such as a museum or an exhibition hall, are not the same. Although the objects are the same, those that are decontextualized and secluded from practical human life, gain a new meaning here. However, despite all criticism towards the context, I believe that they preserve their symbolic meaning and importance. Moreover, based on my previous observations and studies, I would say that, while visiting these exhibitions, people undergo a form of religious experience. Once I worked with Bangladeshi women, who converted to Islam recently, in order to understand the reaction of Muslim society towards the Islamic Gallery in British Museum. It was the first time they visited a museum in England and most of them had not visited a museum before, even in their own countries. They were so affected and excited in Islamic Gallery. In the Islamic Gallery of British Museum, I also saw a visitor that was praying. While undergoing a religious experience in these places, they also experience an aesthetic pleasure by looking at the most elegant examples of Islamic art and become honored. In fact, with respect to looking at the beautiful, the aesthetic and religious experience are the same for us. Muslims perform their acts in its most beautiful form; they look at and love the beautiful. “God is beautiful, he loves beautiful”. I believe that this is the mark of our aesthetic vision though we seem to have forgot this a little bit. Muslims invoke salawat (phrases that complement the Prophet Muhammad) when they hear the name of the Prophet or see any object that belong to Him. Who can judge these people when they invoke salawat upon seeing His objects in a museum. Taking the work as a religious object or as an artwork or experiencing both at the same time depends on the understanding of the visitor. I do not want to ignore curator’s representation methods here, but the understanding of the visitor has priority over all interpretations. Last year, one of the news channels announced the Exhibition of Aşk-ı Nebi (Love of the Prophet) as follows: Directorate of Religious Affairs meets art-lovers with the exhibition of Aşk-ı Nebi in the 1444th anniversary of the Prophet’s birth. One of the newspapers announced the same event as Directorate of Religious Affairs meets Muslims with the Exhibition of Aşk-ı Nebi. That is to say, it is possible to read the same event in two different ways. It is the visitor that decides which exhibition he or she is going to esteem. For example, although most people in Turkey do not visit museums regularly, we witnessed that people fell in line in order to visit the Quran exhibition in Turkish and Islamic Arts Museum. People did not find a Quran exhibition odd in a museum. On the contrary, they show interest in these exhibitions. In fact, Muslims do not need a special place to have a religious experience. There are some points here which I find somehow problematic and which are in need of discussion. The transportation of these works from where they belong to museums, their decontextualization, the line that was drawn between the society and these works and the effects of these factors in our world of thought are worth of thinking. The exhibition of these works as an object, as an aesthetic object of historical knowledge causes a semantic shift. Moreover, I believe that the imitations and the substitutions of these genuine works are radically effective in the deterioration of our aesthetic pleasure. The transportation of these works from where they belong to museums, their decontextualization, the line that was drawn between the society and these works and the effects of these factors in our world of thought are worth of thinking. The exhibition of these works as an object, as an aesthetic object of historical knowledge causes a semantic shift. Moreover, I believe that the imitations and the substitutions of these genuine works are radically effective in the deterioration of our aesthetic pleasure. Could you please talk about the exhibitions of Aşk-ı Nebi? One was opened in Topkapı and the other was opened in Hagia Sophia. How do you evaluate these two exhibitions both in terms of content and the manners of visitors? As far as I can remember, Aşk-ı Nebi is a series of exhibitions that was opened in Hagia Sophia under the guidance of Directorate of Religious Affairs and have been held since 2012 with the support of the Ministry of Culture and Tourism. These exhibitions were held by means of the observance of the birth of the Prophet activities, which is problematic nowadays, and they are of great importance. The fact that these exhibitions are held under the charge of state institutions and the inauguration speeches made by the authorities, make these exhibitions a part of art-politics relationship. They are also important in understanding how Turkish Republic sees art in general and Islamic art in particular in the 21th century. In 2014 and 2015, the exhibitions of Aşk-ı Nebi were taken to the cities such as Washington, New York, London, Cuba and Hawaii and these exhibitions coincided with the visits of Turkey’s politicians, which can be evaluated as an important message of Turkey. If we turn to the visitors once again, for example in 2014, the first leg of Aşk-ı Nebi exhibition was held in Hagia Sophia and the second leg was held in Topkapı Palace, Imperial Treasury. In Topkapı Palace exhibition, among the works that were taken from Topkapı Palace collections, were the precious and rare ones such as, Hilya, caps with the motifs of the footprints of the Prophet, manuscripts’, on which some important events in the Prophet’s life are depicted, the curtain of al-Rawda al-Mutahhara, coverings of the Beard of the Prophet and hadiths written with calligraphy. In this part of the exhibition, it could be observed that the visitors were looking at the works with more respect. Moreover, in the exhibition room, Quran and salawat recitation was being played via a record at a balanced volume and the visitors were also reciting along with the record. The Exhibition of Aşk-ı Nebi was mentioned with the Quran recitation in Hagia Sophia after many years. The fact that these exhibitions are held in Hagia Sophia every year can be evaluated from various aspects. Though it is a museum today, Ayasofya Mosque symbolizes the conquest in the hearts of Muslims and the interior part is embellished with calligraphy. In such a place, a calligraphy exhibition does not seem strange on the contrary it makes it stronger. Although, after becoming a museum it is secularized, Ayasofya’s identity as a church is still in the forefront and this hurts Muslims. Therefore, I believe that the first Quran recitation in Ayasofya after 85 years, in the inauguration of the exhibition, was important in terms of appeasing Muslims. We are living in an age that is challenging for a Muslim. Methods and means are changing constantly, and we do not have time to think about the future results that these changes would take us. Museum and exhibition technologies are also developing rapidly. We hope that in this age, when visuality reached the peak, we develop and come up with new strategies to exhibit our art and our sacred artworks without distorting the meaning and preserve them in a way that would befit the dignity of the “Most Beautiful”. Who is Betül Çakırca ? Betül Çakırca is graduated from the Faculty of History of Istanbul University. She had her first Master's Degree at the Institute of Social Sciences of Istanbul University in the field of History of the Republic with her dissertation whose subject is "Aid from Turkey and the United States between years 1939 and 1945 ". She attended courses at the Süleymaniye Library in the Conservation Workshop on Paper Conservation and the Art of Bookbinding. She found herself in the setting up of the conservation workshop on behalf of the Istanbul City Council for the Mufti of Istanbul's Religious Registers and for the Meşihat Library. Then, she worked on the protection and repair of the books of the religious registers. In the meantime, she completed the Post-Graduate Course organized in Spain by the University of Granada on the "Conservation of Arabic Manuscripts", she won a Montefiascone School Grant in Italy. She paused in her work on the Archives of Religious Registers to complete her second Master's degree in England at the University of Newcastle in the Program Museum Studies with her dissertation entitled "What is the London Muslim Community's Response to the Islamic World" Gallery in the British Museum?”. She did an internship at the Durham Oriental Museum. As part of her PhD Research, she interned with Erasmus for 3 months at The Islamic Manuscript Association in Cambridge in 2015. In the meantime, she has done research in the archives of the British Museum, in Royal Asiatic Society and in the Cambridge University Library.